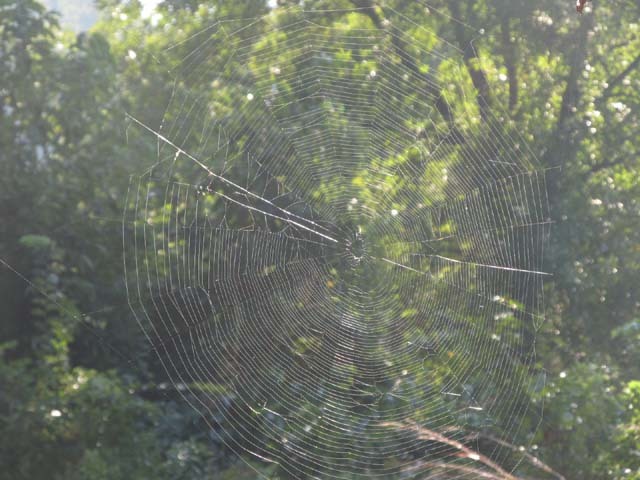 It’s a shame spiders can’t see the beauty they weave. 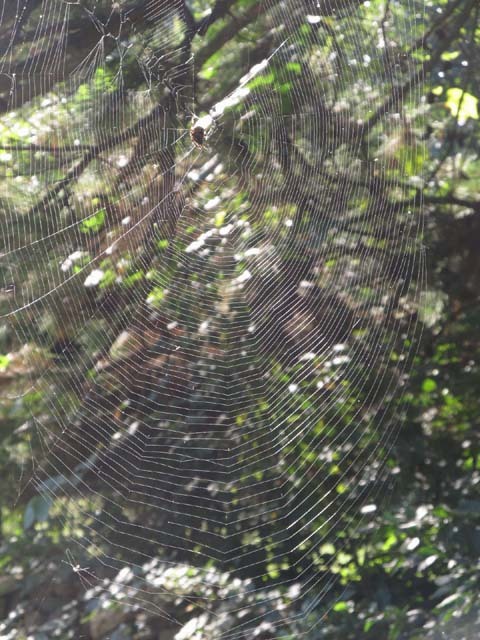 An up-close view or sideways view across the web doesn’t show the spider the intricate design of its efforts. Add in the remnants of fog, the dew and the angle of the morning sun …..
A hackberry butterfly can be real tame when sweat’s involved. 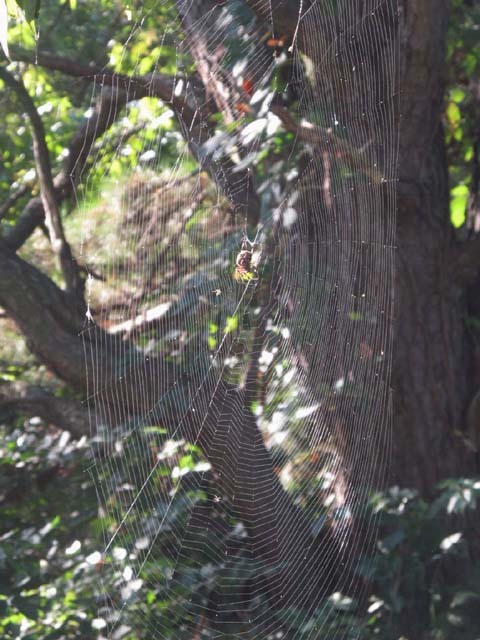 If you look close, you’ll notice it appears to have only 4 legs. 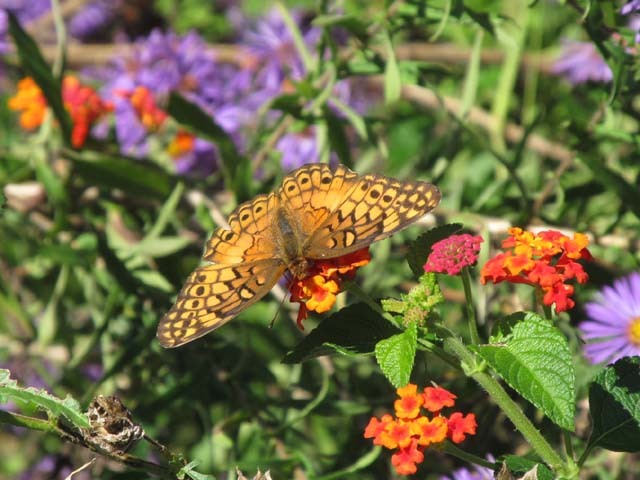 Hackberry butterflies are members of a butterfly family, called brushfoots. Their front pair of legs is greatly reduced. The adults seldom visit flowers. 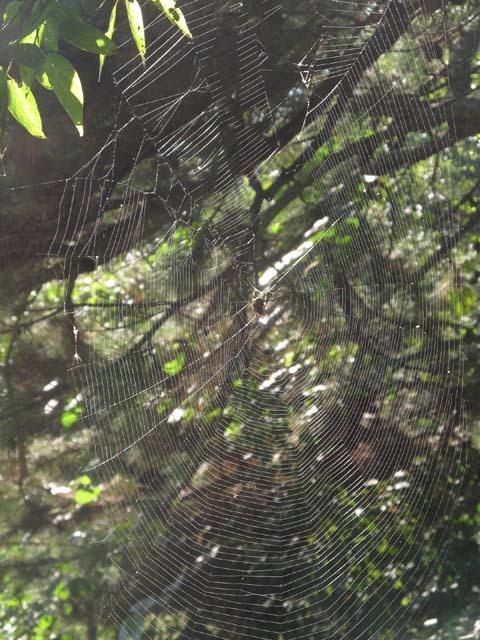 They frequent moist places, fermenting fruit, tree sap and animal droppings. 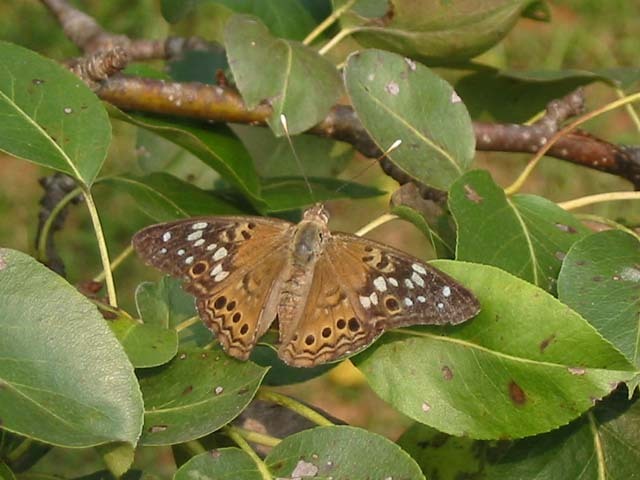 Hackberry butterflies (Asterocampa celtis) lay their eggs on hackberry trees. They are triple brooded in Illinois and fly from May into October. The sunny morning started at 44 degrees and warmed to 66 before noon (date Sept. 8). An east wind at 10 mph kept flowers and plants in almost constant motion. 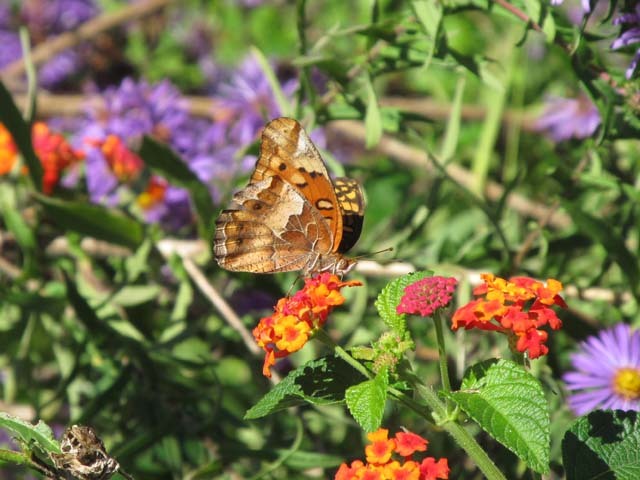 The few butterflies nectared on summer farewell (an aster), lantana and white asters. 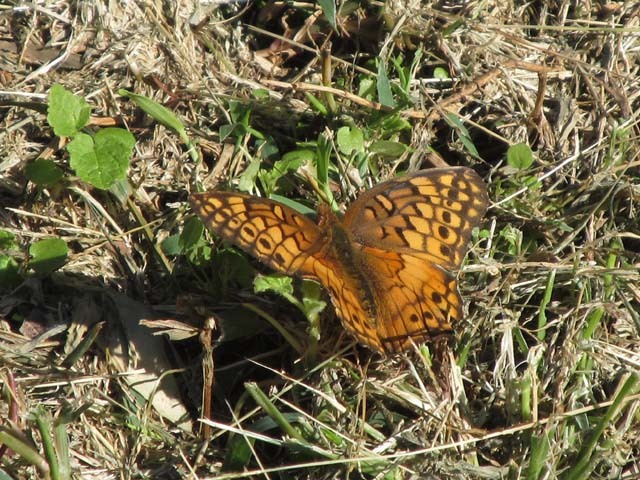 It just so happened I was in the right place at the right time to see a fritillary that wasn’t the great spangled fritillaries that are common here. I took as many pictures as I could as it flitted flower to flower, wings ocassionally pausing for a quick picture. Once it landed in the grass long enough for me to take four pictures as it basked in the sun. I looked up variegated fritillary (Euptoieta claudia) to be sure my indentification was correct. Their caterpillars feed on violets, pansies, passion flower and maypops. This was the first one for me this year. We do get them ocassionally in the spring and fall as they migrate up from the south. To those bloggers I follow — for some reason, your blogs now come to me in email and I’m unable to click like. So, I am viewing, even though I may not comment. I think the name Lilbellula lydia has such a ring to it. 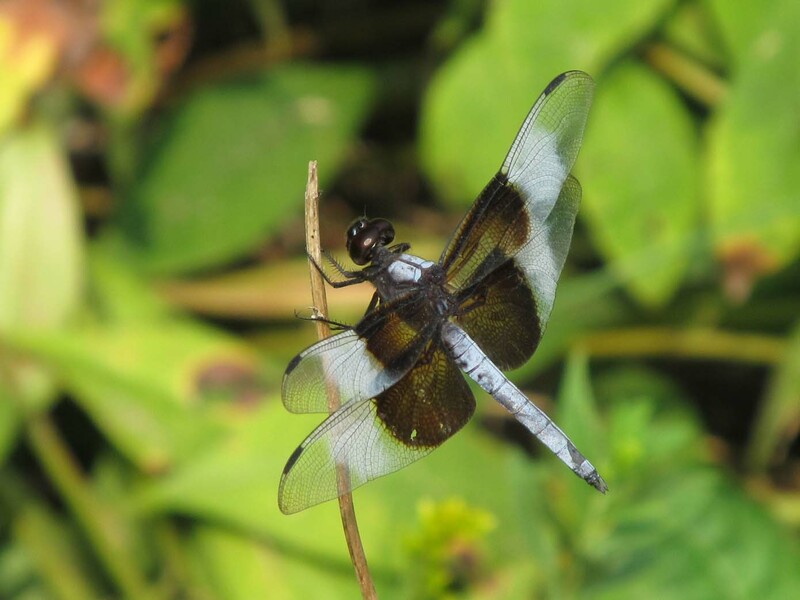 This dragonfly also goes by the common name of white-tailed skimmer. 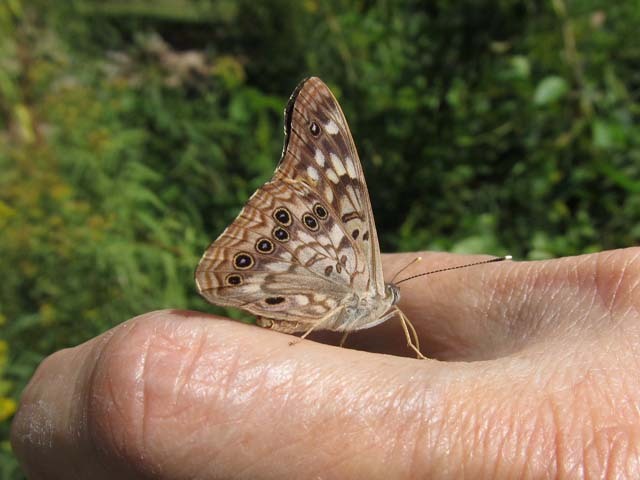 Females have brown abdomens and 3 brown patches on each wing. I haven’t posted a blog in almost 2 months. My fingers are crossed that this round-about way will work! !